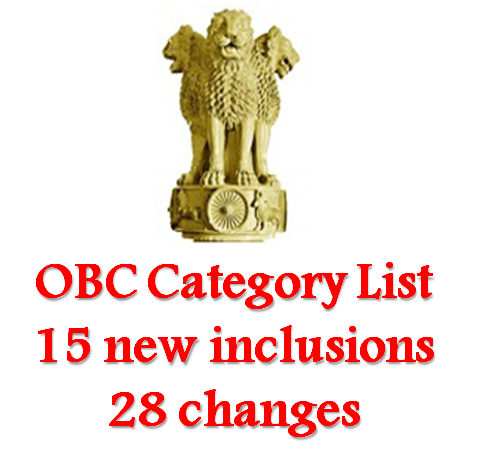 Official OBC list will now have 15 new ‘caste’ inclusions, after Union Cabinet meeting on 30 November. In addition to this, modifications have also been done in 13 other castes of Other Backward Class category as well. Hereafter candidates belonging to the newly added 15 ‘OBC’ castes can avail all the reservation benefits and welfare schemes. 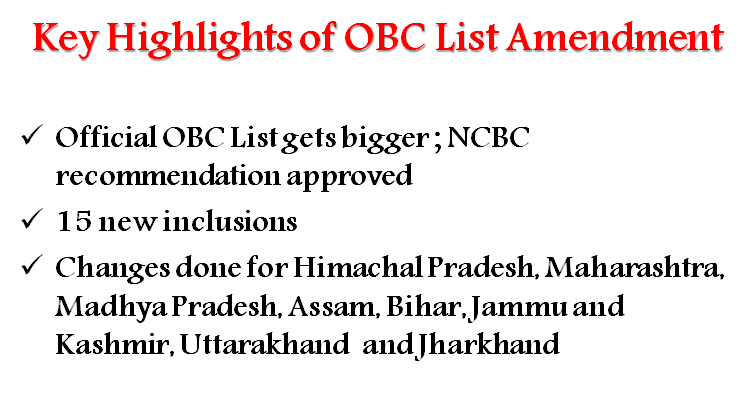 The meeting which was chaired by the PM, approved the proposal of NCBC (National Commission of Backward Classes) in which changes were sought for 28 communities in the States of Assam, Himachal Pradesh, Bihar, Maharashtra, Jharkhand, Madhya Pradesh, Jammu & Kashmir and Uttarakhand. Giving a positive nod to the proposal, the Government has made 28 changes (in the above mentioned 08 States) out of which 15 are those of new inclusions and rest 13 are either the synonyms or sub castes of those already in the list or else modifications. After approving the NCBC recommendations, Govt stated that the changes approved will allow the persons belonging to those categories to avail all the benefits in jobs, educational institutions, etc. “The changes will enable persons belonging to these castes/communities to avail of the benefits of reservation in government services and posts as well as in Central educational institutions as per the existing policy, they will also become eligible for benefits under various welfare schemes and scholarships that are administered by the Central government, which are now available to those belonging to the Other Backward Classes” an official statement said. Meanwhile, there’s a good vibe in the Other Backward Class (OBC) ‘creamy layer’ tussle! The Govt is considering to relax the norms set for OBC ‘creamy layer’. Official update, this regard, however has not been given out yet.